and i owe it all to a very, very old southern living cookbook that i thumbed through while staying at my dear friend, tanna’s house in okc. this recipe has come in handy a lot this summer when we are not home very often and our kitchen food supply is hilariously low. i usually have crescent rolls in the fridge (due to the husband’s affinity for them), so this recipe gets made a lot on the rare mornings we are home. and it gets eaten extremely fast. 1. preheat oven to 375. lightly grease a 9-inch round cake pan or pie dish. 2. unroll crescent roll dough and separate into 4 rectangles. pinch perforations within rectangles to seal. lightly brush dough with melted butter (this helps the sugar & cinnamon stick, but you can omit this if you’d like). in a small mug or tiny cup, stir together sugar and cinnamon and then sprinkle mixture evenly over rectangles. 3. roll dough up, jellyroll fashion, starting with a long side. pinch edges to seal. using a serrated knife, gently cut each log into 5 slices and place in cake pan. 4. bake for 15 minutes or until rolls begin to brown. 5. while the rolls are baking (or cooling), combine the powdered sugar, milk, & vanilla and stir until smooth. 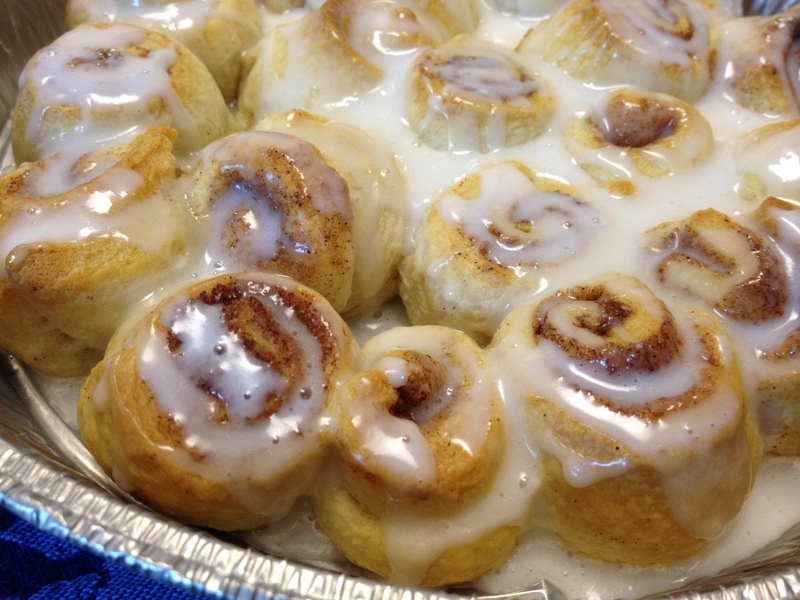 drizzle over the warm cinnamon rolls.